Summary: Isabella Kirkwood had it all: popularity at a prestigious private school in Manhattan, the latest fashions, and a life of privilege and luxury. Then her father, a plastic surgeon to the stars, decided to trade her mother in for a newer model. When her mother starts over with her new husband, Bella is forced to pack up and leave all she knows to live with her new family in Oklahoma. Before her mother can even say "I do," Bella's life becomes a major "don't." Can Bella survive her crazy new family? Will the school survive Bella? How can a girl go on when her charmed life is gone and God gives her the total smack down? My Thoughts: The first time I saw this was down the book aisle at Wal-mart. It caught my eye. I just knew I had to read it. We meet Bella who is just a normal girl from New York. She likes fashion and is somewhat spoiled. She is forced to move to a country town in Oklahoma because her mom got remarried to some guy she met on the Internet. Bella gets stuck with two stepbrothers, one which is around the same age as she is. We also meet her boyfriend Hunter from New York. I did not like him at all, from the get go. Something about the guy just annoyed me. We also meet Luke, who works on the newspaper at the new school with Bella. Now, I did like him. Bella finds a interesting story with the football players of town. I don't want to give away the book but this is such a cute story. There were a lot of laugh out loud moments throughout the book. Also, enough quality characters to keep the story interesting. Even though i could see what was going to happen with Bella's best friend, I still wanted the smack the best friend a few times! Arrg! I also really liked Bella and Luke. Their first kiss was so amazing, it had me smiling as it was happening! What is the mystery story behind the football players? What about with Bella and Hunter? Bella and Luke? I can't wait to read book 2. Overall: Really liked it a lot. Liked the characters and it was a cute story. 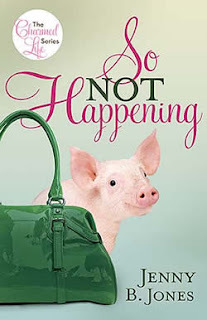 Cover: Makes me want to know the story between the green purse and the pig. Sounds nice a fun and sweet book! Adore the cover! A love triangle Love it. Sounds like a really good book. I love the cover-it just makes you want to read it. Good review.